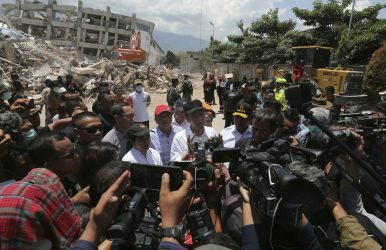 Indonesian President Joko Widodo, center, talks to media after visiting earthquake and tsunami-damaged Roa-Roa Hotel in Palu, Central Sulawesi Indonesia (Oct. 3, 2018). Will ‘Fake News’ Determine Indonesia’s Next President? Nearly two years after Ahok, is Indonesia better prepared for misinformation ahead of 2019’s presidential election? Last month, the world watched in shock as Brazil elected Jair Bolsonaro to the presidency, in another election campaign where misinformation, viral memes, hate-filled rhetoric, and electoral interference played a key role. With the United States, India, and Brazil all under the control of right-wing leaders who use inflammatory rhetoric to build support and are beneficiaries of misinformation, eyes will now turn to the world’s other large democracy – Indonesia, which is less than six months away from its own crucially important presidential election. Indonesia had its own taste of a Trump-Bolsonaro style election early last year, when a campaign full of misinformation, viral memes, and derogatory religious and ethnic rhetoric led to the shocking defeat of Jakarta Governor Basuki Tjahaja Purnama, popularly known as “Ahok,” himself ethnically Chinese, Christian, and formerly a running mate of President Joko “Jokowi” Widodo. This might have been a blessing in disguise, because it meant that Indonesia, unlike Brazil, had time to prepare for the next wave of misinformation before it impacted national politics. In fact, under Jokowi, the government has taken several controversial steps to limit the impact of misinformation, from the passing of stronger legislation and regulations, to the creation of a government-run war room on fake news. The country’s media is also playing a role through the new CekFacta collaboration. The question is: Will these moves save Indonesian democracy, or do they pave the path toward a potentially more worrisome future that hearkens back to Indonesia’s not so distant authoritarian past? Are Government Actions Enough, or Too Much? Jokowi’s response to Ahok’s loss, and subsequent jailing, was two-fold. He likely knew what was to come – as rumors questioning his religion, ethnicity, and political leanings all played a role in the closer-than-expected result in his election as president back in 2014. Thus Jokowi responded by shoring up his Islamic credentials, most visibly highlighted through the surprising choice of Islamic cleric Ma’ruf Amin as his vice presidential running mate instead of a more moderate choice like Minister of Finance Sri Mulyani or former Constitutional Court Chief Justice Mahfud MD. The second response is more controversial. The government has strongly increased its ability to go after those who spread misinformation. The first target was hardline Islamist group Hizb ut-Tahrir, which spearheaded the anti-Ahok campaign and was banned last year. Then came efforts to re-emphasize the Indonesian nationalist ideology of Pancasila, which had fallen into disuse since the ouster of Suharto, and with it a renewed call to counter anti-Pancasila organizations or rhetoric. The government got even more power this past May when, after a series of terrorist attacks targeting churches and police station in Surabaya, Jokowi forced the passage of a stronger anti-terror law that, among other things, has an overly ambiguous definition of terrorism. The NGO Human Rights Watch is concerned that the this means the bill could be used to target peaceful political activities activists, religious, or political organizations. Since the advent of openly contested elections in 1999, Indonesia has seen a media revival. Today, it has a generally free press, though one that has become increasingly fragmented. The Indonesian Association for Media Development estimates that there are 40,000 media outlets in the country, which due to the popularity of social media, can get their message out to audiences quickly. Evidence shows that it’s often deliberately misleading news that goes viral in social media. Enter CekFacta, a partnership between 22 of Indonesia’s most well-known and respected media outlets, which aims to create a space for collaborative fact-checking and verification that can counter misinformation, ideally becoming a trusted information portal for Indonesians. The biggest challenge, according to Wahyu Dhyatmika, editor at Tempo Media Group and a leader of the partnership, will be distribution, which remains in the hands of mostly foreign social media and technology. “Although we can tackle disinformation quite effectively, the real challenge is to deliver our debunked articles to the origin of the hoax and to the people already affected or influenced by it,” said Dhyatmika. “In an era of post truth, this is proving to be very tough and could be a make or break moment for us.” CekFacta is working with Google and also hopes to collaborate with Facebook on this, but it remains to be seen how effective that effort will be. One strength is that CekFacta will operate completely independently of any government effort. In fact, Dhyatmika believes that the government should leave the fight against misinformation to third parties due to a fear that many in civil society and the press have – that this power can be used, if in the wrong hands, to suppress free speech. For many in the media, the memories of the three-decade long Suharto dictatorship – when censorship and intimidation of the press was common – is all too fresh. Giving power to the government can have unintended consequences. When it’s fake memes of Jokowi supposedly attending an Indonesian Communist Party rally in 1955 – before he was even born – then the government may be justified in taking action. But what about when the government itself is the target? Early last month, IndonesiaLeaks released a detailed, collaborative investigative report accusing a senior police officer of accepting bribes, implicating Jokowi’s administration and his anti-corruption effort. Suddenly IndonesiaLeaks was derided as “lacking credibility“ and even reported to the police. What is truth and what is misinformation is often in the eye of the beholder, especially when the judge is the state. Still, while the potential for harm is there, it’s hard to blame Jokowi or Indonesia for at least trying. A taste of what things might look like during next year’s election season took place late last month, when Lion Air flight JT-610 crashed en route from Jakarta to Pankal Pinang, killing everyone on board. Immediately, images spread on social media purporting to be from the plane crash, or making false claims, like a rumor that a baby survived. Indonesia immediately responded, with the government warning people to not spread fakes news. The spokesperson of Indonesia’s disaster mitigation agency, Sutopo Purwo Nugroho, was active on Twitter debunking fake images, with his tweets getting tens of thousands of retweets and being widely reported in the media. This active approach is unique globally and it is likely a sign of what’s to come. Already, the government is holding fake news weekly briefings, and the aforementioned fake news war room has dozens of government employees actively monitoring Indonesian social media for the first sign of misinformation or fake viral memes. In fact, there have been several hopeful signs since Ahok lost. Despite fears, last year’s regional elections saw few incidents of ethnic or religious divisions, or the use of misinformation, leading many to believe that what happened with Ahok might have been an isolated case due to his unique position and personality. So far, the movement that took him down has not been able to reorganize for any other cause. Of course, presidential election years are always different and unpredictable. Jokowi’s opponent, Prabowo Subianto, is almost certainly going to run from the right and may embark on a Trumpian campaign. But unlike in pre-election Brazil or the United States, Indonesia has taken concrete measures to prepare for misinformation, with the government and the media gearing up to respond and debunk hoaxes, lies, and fake news. Now we’ll have to wait and see whether it’s enough — or, perhaps even more worrisome, too much.